Industrial packing can consist of many forms of packaging. One of the most common forms are material handling trays or shipping trays. 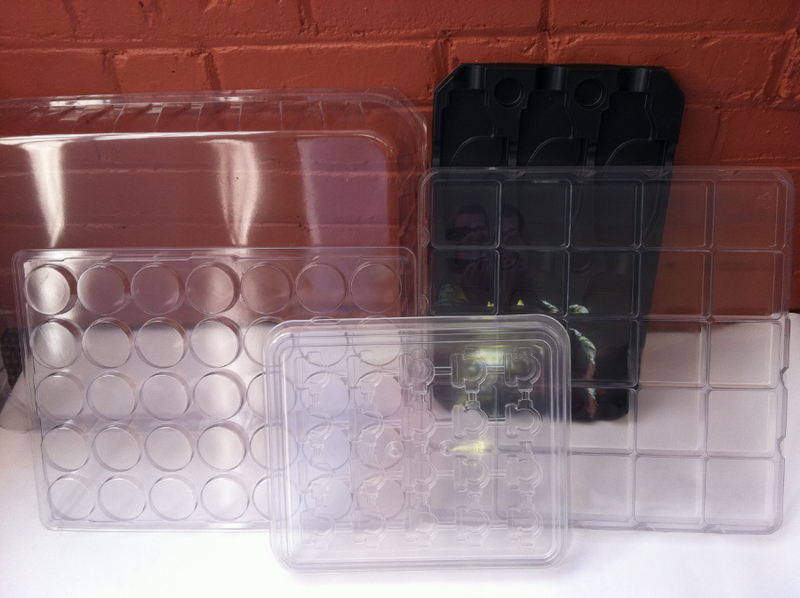 Trays can be made from a variety of plastics such as PVC, PET, and HIPS and are easy to clean, have good solvent resistance, and offer very good impact resistance. As the material is normally thicker for improved durability and stiffness, handling trays typically cost more than a comparable disposable tray. Frequently components or assemblies require special support or clearance. We can design a Custom Thermoformed Material Handling Tray’s geometry to suit your production process and handling requirements. In many cases the forming mold can accommodate a variety of thermoplastic materials so that the trays can be optimized for durability, stiffness, and cost during the prototype stage. Frequently a material change may be desirable after the first article is tested in production. Custom thermoformed Material Handling Trays can also incorporate a lid for protection of the components if desired. SouthPack can meet all of your industrial packaging needs, please call 888-SOUTH03, Ext. 16 (888-768-8403) now or contact us today.